I arrive at The Shipping Forecast and manage to get 2 feet through the door before being greeted by the man himself. This is typical of Ali Ingle – friendly, open and general all round nice guy. Ali’s not one for hiding backstage, maybe because The Shipping Forecast doesn’t have a backstage, but still, if it did I’m sure he’d be out mingling and clinking glasses with the audience. The stage looks strangely bare. It’s reminiscent of the room in R.E.M’s ‘Losing My Religion’ video (without the creepy religious associations), it’s dark and dingy but in a cool kinda way. There’s a definite ’underground private party’ vibe and yet somehow I’ve managed to make it inside. I arrive just in time for Atlas Twins (sorry to Joseph Dene & The Undercuts). Atlas Twins are a 2 piece, but I would describe them as more of a partnership rather than a duo or band. There’s a closeness about them that’s evident in their music. I try my hardest in life to not judge a book by it’s cover, but Atlas Twins are the most unlikely of people to be making such fantastic sounds – The combination of a Berghaus jacket, a pair of vans and a trilby does not translate into the majesty of their beautiful music – personal life lesson affirmed. With a spanish/folk guitar style, there’s rhythms and picking techniques that can only be attributed to an entire youth of classical guitar training (either that or being a product of LIPA) … but the how is not important, all you need to know is it’s bloody good. Then come the vocals, which do not disappoint. I imagine this is what all those greek sailers heard while their ships were lured towards the rocks (apologise for the caffeine induced mermaid reference) … the point is that the vocals are angelic. Atlas Twins are a genuine talent. You’d be hard pushed to find a better acoustic folk duo. They closed their set with the soft and dreamlike track ‘Amorous’ which, despite being their oldest track, was their stand out track for me. My only criticism would be – tune the guitar before you get on the stage guys. No audience enjoys the ‘eadgbe’ song. At this point the place is now packed. Ali takes stage & gives the thumbs up to the sound desk and people start rushing to the front! Unheard of at an acoustic gig, let alone an unsigned gig. The crowd is almost silent when compared to the noise level of the few rude people chatting for the duration of Atlas Twins set (insert snarly face). “Hello…” says Ali, which is greeted with screams and a splatter of camera & mobile phone flashes. It’s safe to say Ali is onto a winner tonight. His 2nd track ‘A Moment Of Us’ has a real anthem feel about it. About 4 or 5 songs in Ali hits the crowd with an older tune that asks “Can we go all night, all night?” which sparks the crowd into backing singer mode, and truly shows how infectious Ali’s songs can be. From his new EP it’s ‘Tornado’ that’s goes down the best. His new songs can’t have been available for general consumption for too long, yet the crowd are filling in the purposely muted blanks, just before Ali kicks into yet another catchy chorus. There’s a buzz in the air and Ali is loving every second of it. It’s amazing to see one guy with so many avid followers. Song requests are flying towards the stage, left, right & centre, as every crowd member seems to take personal ownership of at least one of his songs. Ali has a voice and style that’s probably closer to other artists that are out there, say somewhere between David Grey and James Blunt, but combine that style with his song writing talent, faultless performances, general charm and humbleness (which comes by the bucket load) and you’re onto something that’s a bit special. 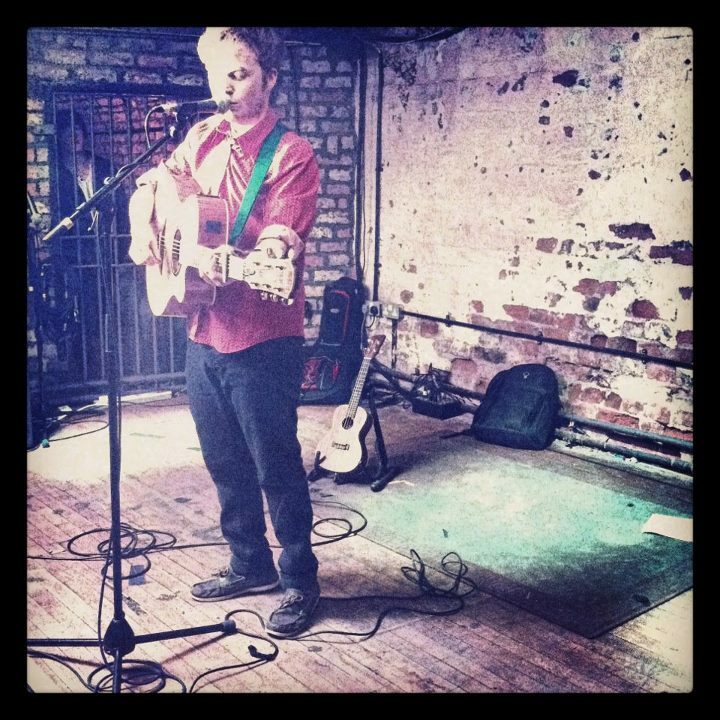 The post Ali Ingle EP Launch @ The Shipping Forecast, Liverpool appeared first on MakoMusic.